Gum recession, or the displacement of the marginal tissue in a apical (downward) direction, is one of the most common issues perodontists are consulted on. While many patients believe that gum recession is the primary symptom of gum disease, there are actually many causes – sometimes even several causes at once. Gum recession causes all kinds of trouble including extreme root sensitivity, the unattractive collection of food particles, the formation of root cavities and decay, and loss of root structure due to mechanical wear. Who Needs Treatment for Gum Recession? While the majority of our patients suffer from receding gums, not all patients need treatment. Surgical treatment is based on severity and progression rate, type of defect, esthetic concerns, and if the patient is symptomatic. These symptoms include sensitivity to hot and cold, painful to brush, and acute infections with swelling. 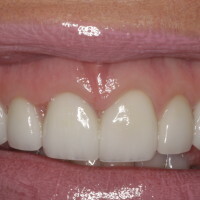 Dr. Lanman performs several surgical techniques to correct receding gums and increase the amount of attached tissue (keratinized gingiva). Keratinized gingiva is the appropriate type of tissue that surrounds our teeth and is resistant to future recession. The majority of surgical procedures use either donor tissue or your own tissue. We will base the decision of which type of tissue to use on your particular needs including whether you can tolerate a second surgical site, location and number of teeth involved, and what is in the best interest, long-term for each patient. We will always inform and educate you about your options, as well as the pros and cons of each technique. If your gums are receding, please give us a call. We’d be happy to talk to you about your treatment choices and options.